Emmy York brings in the final out as Alexa Gross waits to congratulate her. 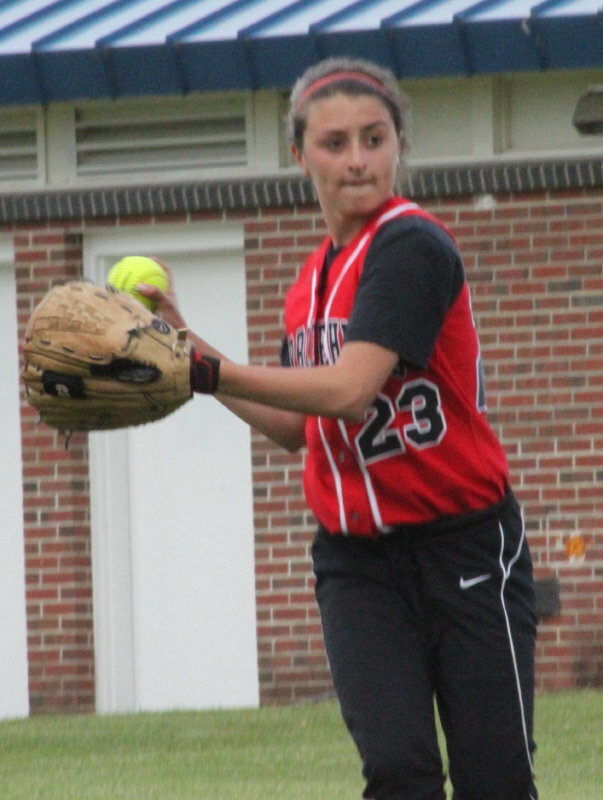 (Byfield) Opportunistic Marblehead bested Triton, 7-1, in the preliminary round of the MIAA softball tournament on Thursday afternoon and will now face top-seed Amesbury (18-2) on Saturday afternoon (4PM) at Amesbury in a First Round match. The conditions at Triton? It was the familiar (cold and cloudy) and the unfamiliar (gusty winds). Early spring weather continues! 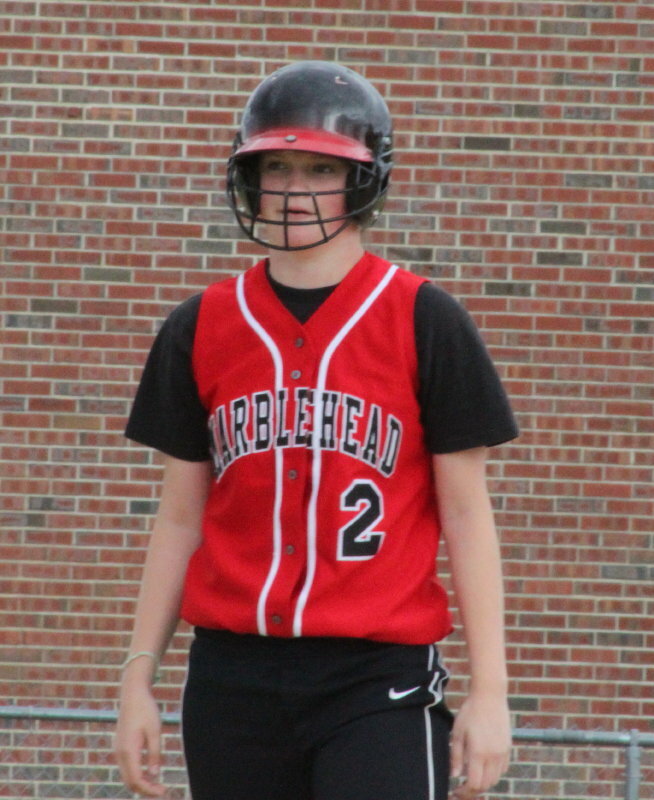 Marblehead (13-10) had only five hits off of Triton starter Marion Dullea but three of those hits were for extra bases. The Magicians stranded only two runners. Triton (11-10) was all over the base paths with nine hits but stranded ten runners including at least one runner in six of the seven innings. 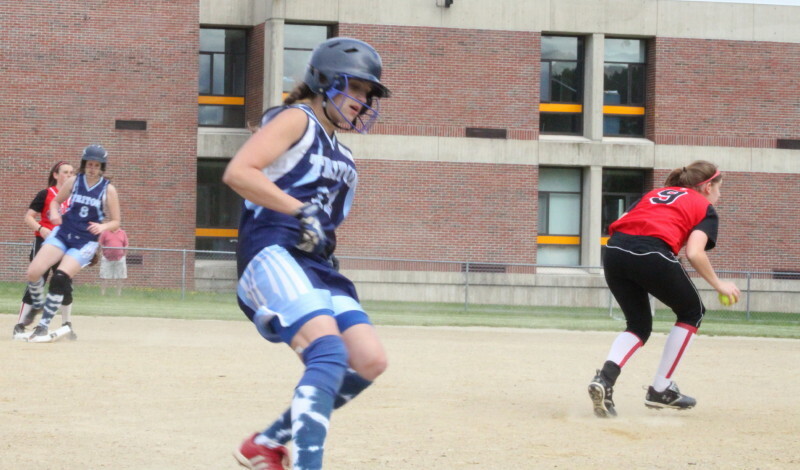 Marblehead leadoff batter Kathryn Digiammarino blasted two triples, scored two runs, and drove in two runs. The Northeast Conference All-Star shortstop was solid in the field as well. Cori Simons reaches third and Jenn Delaney second but the Vikings couldn’t score in the first inning. The Vikings had a major squander in the first inning. They loaded the bases on two hits (Cori Simons & Jenn Delaney), and an error (3B Lucia Chalek), with only one out. However, Marion Dullea’s fly ball to left field turned into a double play when LF Olivia Vener’s strong throw home easily nabbed Cori Simons. Catcher Carly Score had the ball waiting by the time Cori arrived. The Magicians didn’t get a hit until the top of the third inning but it was a big one. Alexa Gross and Rachel McKay had just reached on Marion Dullea’s only two walks of the game before Marblehead’s first hit (Kathryn Digiammarino’s long triple to right center) brought in both of them. The next hitter (Olivia Vener) bunted and Kathryn was caught in a rundown between third and home. 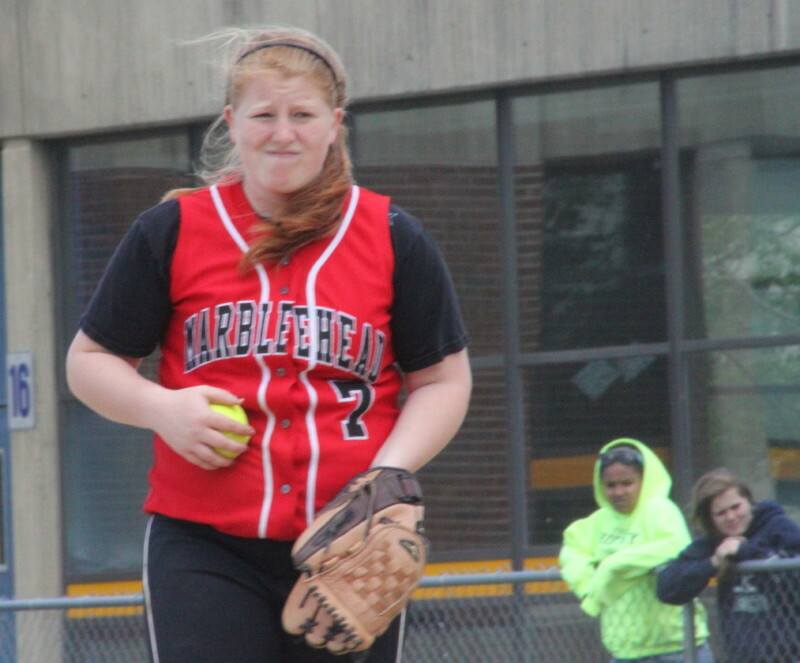 Triton executed the rundown poorly and Kathryn scored Marblehead’s third run. Olivia reached second during the rundown and scored on Lucia Chalek’s double to center. The Magicians added to that 4-0 lead with another run in the fifth. Rachel McKay singled, was sacrificed to second (Olivia Vener), and came home when right fielder Cori Simons dropped Lucia Chalek’s fly to right. 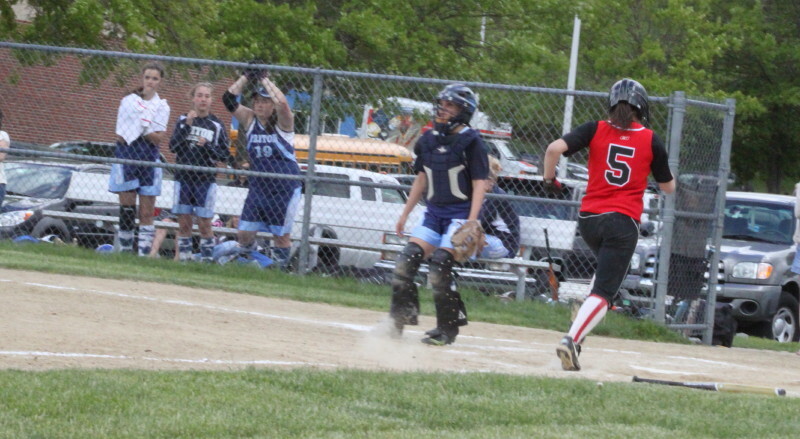 Julia Lothrop beats the throw home in the sixth inning to score Marblehead’s sixth run. Another unearned run came in the sixth. Sarah Hastings reached on Brook Jamison’s error (grounder went through her legs). Julia Lothrop ran for Sarah. Julia stole second and was sacrificed to third by Emmy York. 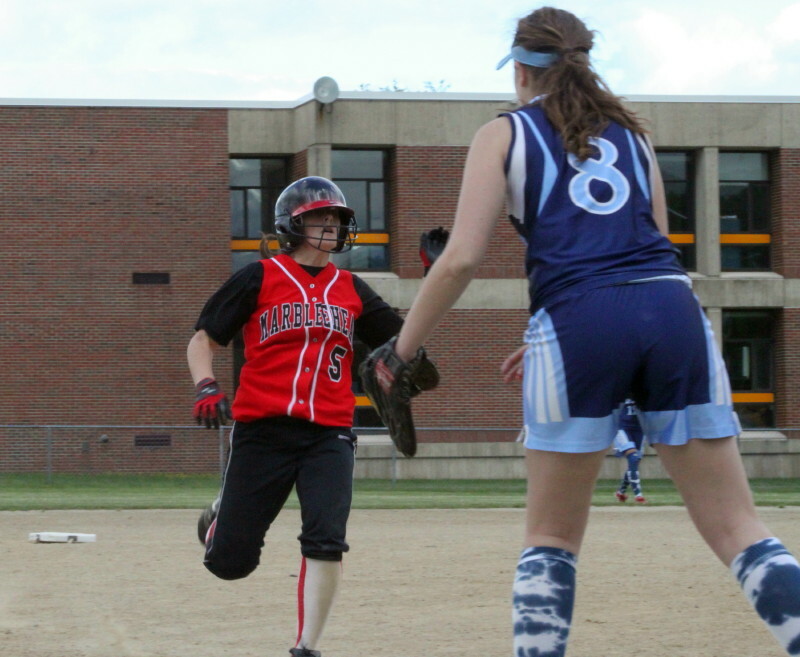 Carly Score’s sacrifice fly to center brought Julia home with Marblehead’s 6th run. Kathryn tripled to center in the seventh and came home when the Triton infield bobbled the relay throw from the outfield. Triton’s lone run came in the bottom of the seventh. Cori Simons singled and later went to third on a 2-base throwing error by catcher Carly Score. Cori scored on a Jenn Delaney grounder to pitcher Michaela LeBlanc as the pitcher’s throw home was late. 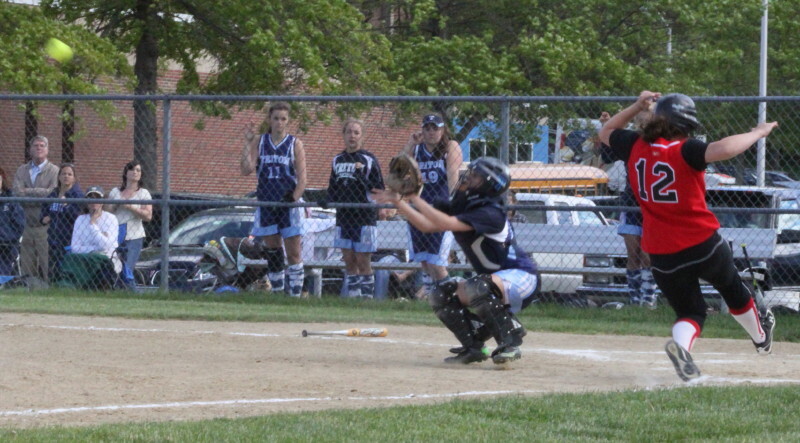 Cori Simons had three hits for Triton. 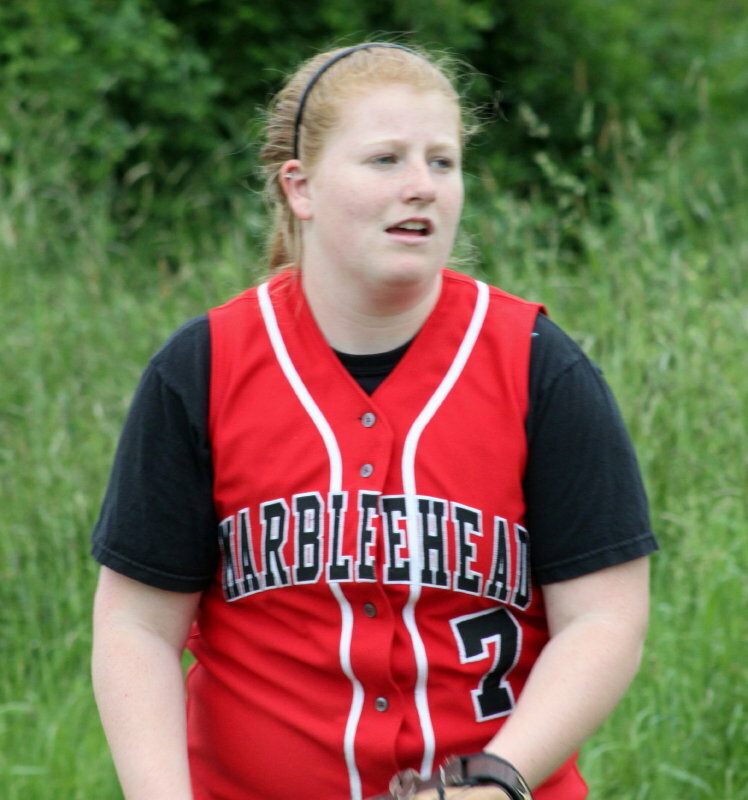 Rachel McKay scored two runs for Marblehead. 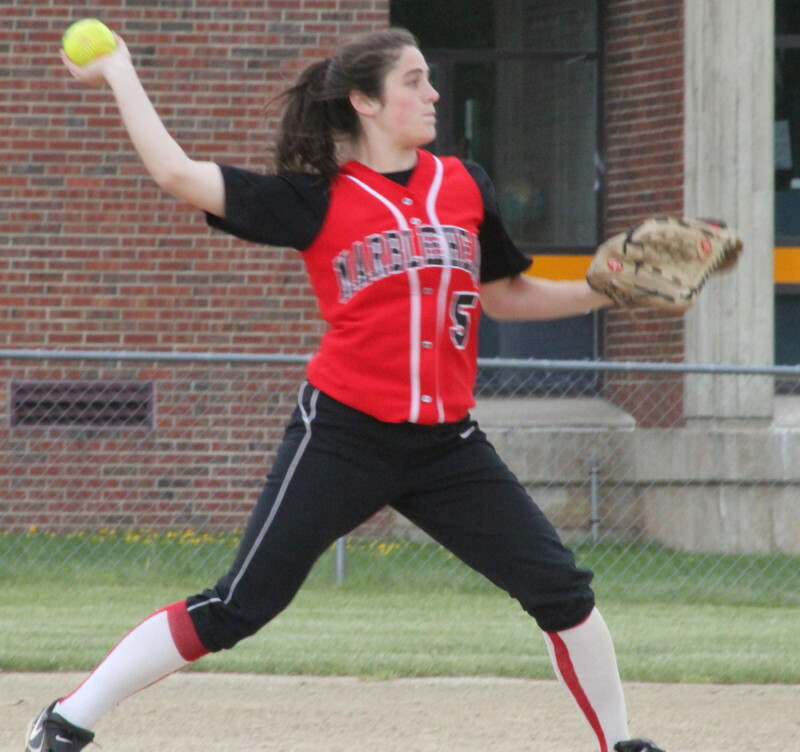 Michaela LeBlanc – Magician freshman was complete game winner. Freshman pitcher Michaela LeBlanc gave up nine hits but no walks. Triton starter Marion Dullea walked two and both scored in the third inning. 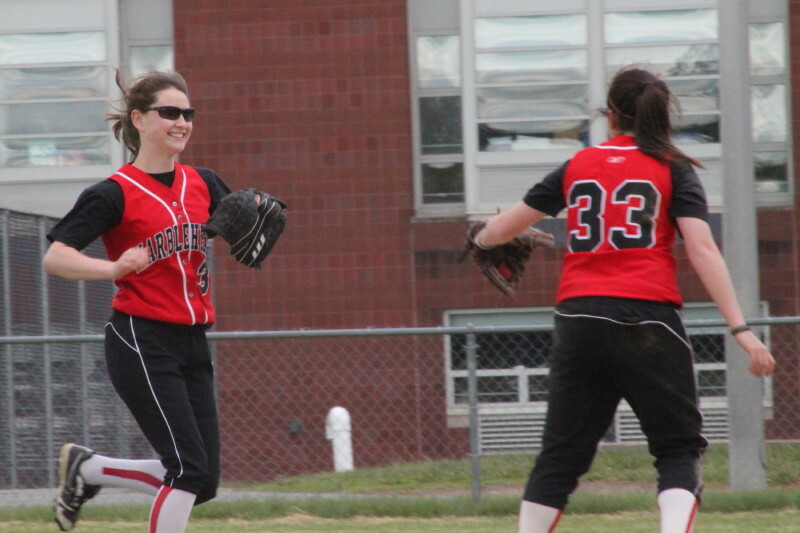 Marblehead coach Jon Gold didn’t have to use his usual starting pitcher (Sarah Hastings) in this one. Look for her to start at Amesbury on Saturday. The Magicians are seeded #17 in Division 2 North. They have made the tournament five of the last six seasons. Getting confused at a high school softball game is easy with no scoreboards or rosters. Trying to keep track of players is an adventure even if you have the rosters and know the score. The Marblehead 6th is the classic example. Sarah Hastings reached on an error and so Coach Jonny Gold put in a pinch runner. The runner’s number was #12. I had a copy of Coach Gold’s lineup for the game and #12 (on his card) was Julia Lothrop. Julia would end up stealing a base and scoring a run. However, a program was given out at the game by Triton AD Donna Andersen. I checked it afterwards and see that #12 on it is Kathleen Reilly. Julia Lathrop (different spelling) is listed as #8. And some folks wonder why reports of softball games aren’t accurate??? Julia Lothrop steals second as Brooke Jamison takes throw.